Lagooning is a natural technique for used water treatment that uses the self-purifying functions of aquatic ecosystems. The principle is to pass sewage by gravity flow through a succession of ponds where the metabolism of organisms (bacteria, plants, etc.) 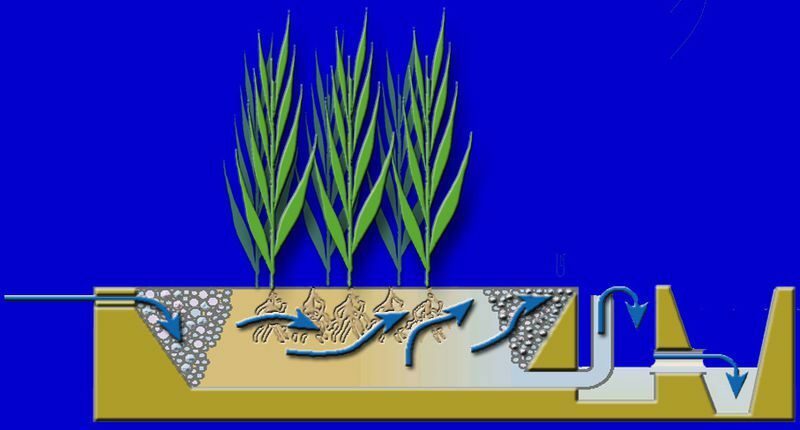 ensures the depollution of the water (phytoremediation) while the substrate and plants filter the material. Lagooning is an interesting option due to its low energy and economic cost, as well as its insertion into landscapes and local biodiversity as a wetland. However, this technique requires large land surfaces and does not adapt well to major seasonal variations (for example, in touristic sites) as well as occasional, major pollution. Moreover, this system does not produce water that is 100% free from pollutants.